We’ve talked a bit about Dillon’s work before, reviewing a few months ago their quite excellent Cherry Gin. 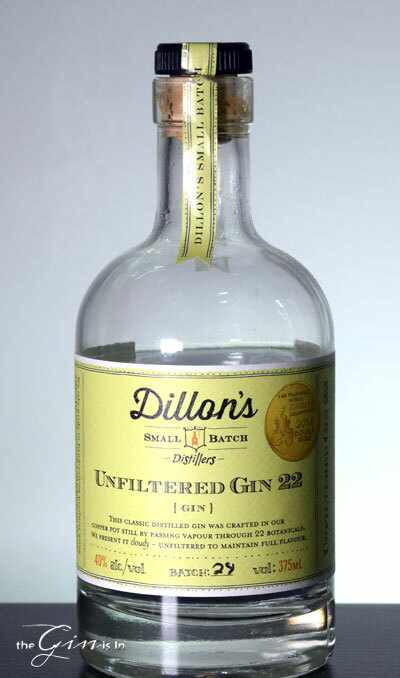 Whereas their Cherry Gin [among a couple others from their lineup] use a Rye base, their Dillon’s Unfiltered Gin 22 is something of a change-up, an ode to the Niagara Peninsula where grapes and wine are among the regions’ specialty. Using a local grape base, gives this gin a bit more of a French touch, and puts it among some pretty lofty company with gins like G’vine Floraison, who also hail from famous wine regions and who use the local grapes. The team vapor distill Dillon’s Unfiltered Gin 22 and do not filter it, so that it retains more of the essential oils from the botanicals. This does mean the Ouzo effect will be present when cold water is added (a.k.a. the Louche in Absinthe), but this too isn’t completely unusual, gins like Vor also show this characteristic. This generally creates a more vivid picture of the botanicals used (and in this case, all 22 of them! ), but can make mixing unexpected or more complicated. But enough setting the stage, how does it taste? Bright, floral leaning nose with pine-leaning juniper, lavender, notes and some lemon/lime citrus. The palate is clean and crisp, with lavender again, lime, and juniper written all over it. Maybe a touch of pink peppercorn, cassia and coriander as well. The finish is pleasingly warm, but flavor-wise is relatively short. It fizzles out in a roar of heat with maybe a touch of lime zest. Though it’s only 80 proof, the heat/warmth builds as you sip it, particularly in a Martini. That being said, Unfiltered Gin 22 has a lot of character to it, and it’s most certainly a good martini gin. Works well in Negronis, Aviations and Gimlets as well.